Game of Thrones Season 7 Spoilers Release Date: A leaked concept art has confirmed the GoT 7 finale scene. By this time, it has become our habit to guess and discover the Game of Thrones spoilers from the leaking set photos. But the latest GoT season 7 spoiler comes from a major and detailed concept art. Speaking of the latest news, two images have been made available online (may be leaked). The photos of GOT 7 depicts a scene which was filmed as a part of the GoT season 7 finale. 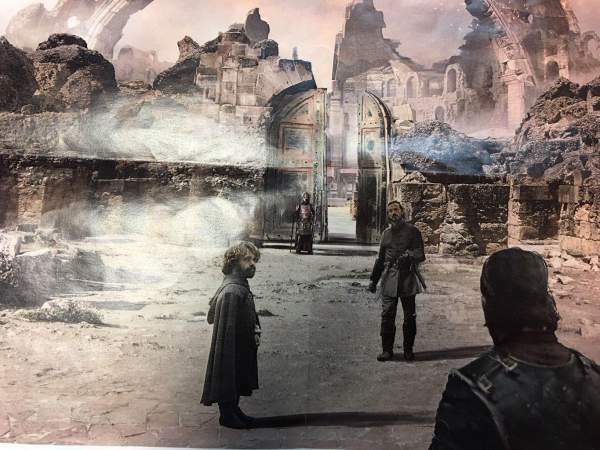 The first picture shows Tyrion and Bronn inviting Jon Snow into the Dragonpit (a ruin located near King’s Landing). The GOT 7 leaked art is titled as Game of Thrones VII. Dragonpit Entrance. A fan dedicated spoilers’ site Watchers on the Wall has confirmed that it is legit. They have found it in common with some filming details from Italica, Spain. The shooting took place back in November 2016. Moreover, it looks like a major gathering of the major characters from the HBO’s fantasy TV show. Those includes Jon Snow, Tyrion Lannister, Bronn of Blackwater, Queen Cersei, Daenerys Targaryen, Ser Jorah, Varys, Missandei, Qyburn, and The Mountain. They all were present at the scene. Check: Arrow Season 5 Episode 12 air date. Why do you think such a grand meeting took place? Why did people gather at the same venue who hated each other? Why did they assemble? It may be due to Jon Snow showing them all one significant fact. He may have brought the captured wight to demonstrate that they all need to unite to fight the White Walkers and the Night’s King. We are considering that is the same white wight which Jon Snow captured earlier in the season. He had headed north to trap it and carry to show them the real and biggest threat coming this winter. As of now, HBO has officially announced the Game of Thrones season 7 release date. But, it may have been leaked through IMDb which started June 25 as the premiere date for GoT 7. It debuts this summer on HBO in the US and Sky Atlantic in the UK. Stay tuned for latest GoT news and other TV series updates across the globe.